Some of us want to do something to make ourselves feel better. We want to be fitter, stronger, happier, more successful, more vibrant, more alive. Absolutely, yes please. Some of us want to do something to make the world a better place. We want to help others, create peace, share love, make beauty, create social change and justice. This is the path of compassion, of purpose, of connection. Now sometimes we do one, and forget about the other. There are many who improve their own circumstances at the expense of others, or who don’t give a second thought to those less fortunate. And there are those who do ‘good’ to simply to prove themselves, or who are martyrs who forget to nourish themselves and end up burnt out and sick. But ultimately we are both an individual who deserves happiness, health, and abundance, and part of a collective being (Humanity-Earth), which when it is cared for, harmonious, and thrives, gives back to each and every one of us. Through being involved in both yoga and social/environmental change for over 15 years, I’ve discovered that yoga is a path that ultimately leads to both – in a deeply authentic way. 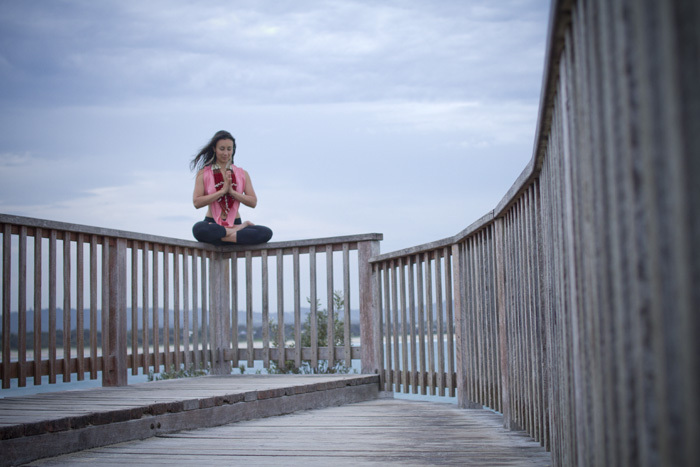 Even if you start on the path of yoga purely to make yourself feel better, soon enough, the benefits should start to awaken you to the impulse to connect and serve life – for the benefit of all beings, yourself included. But for this, your practice needs to be committed and authentic, your understanding needs to be clear and intelligent, and of course it helps to find guidance, inspiration, and support on the path! So I combined my passions into a 4-week workshop series called Light The Spark! The idea is to help you deepen and commit to your own purposeful yoga practice, understand the connection between personal practice and ‘service’ (seva) for the world, receive guidance and inspiration, and connect authentically with others who are on the path. We do this through meditation, asana, philosophy, creative and intuitive practices, and group discussion. And you’ll also be supported to develop a daily practice. It is a practice for personal transformation, and a practice for social transformation. It’s for both for already committed or aspiring yogis, and also for ‘changemakers’ who are curious but might not have started on the inner journey yet. If this sounds like something for you, please get in touch! 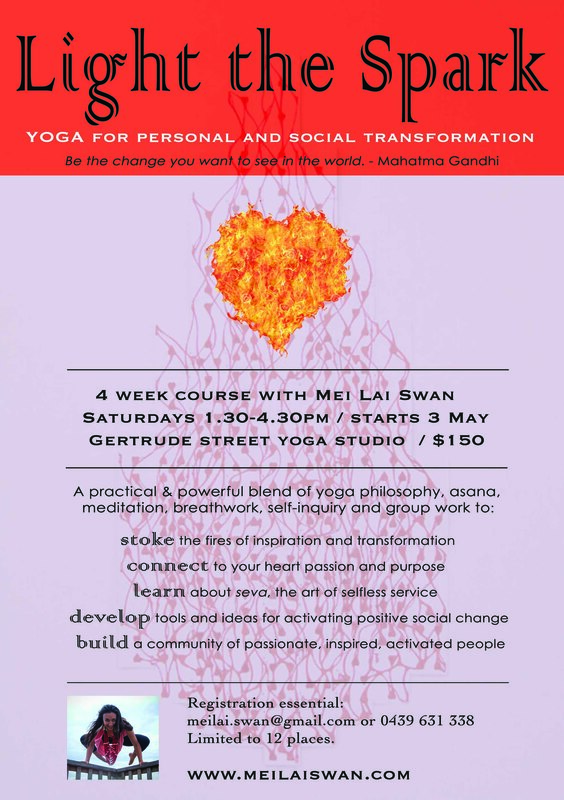 Round two of the workshop is starting this coming Saturday 3rd May at Gertrude Street Yoga Studio, 1.30-4.30pm, and it would be wonderful to have you there for the journey! It can transform the smallest grain into the grandest architecture. 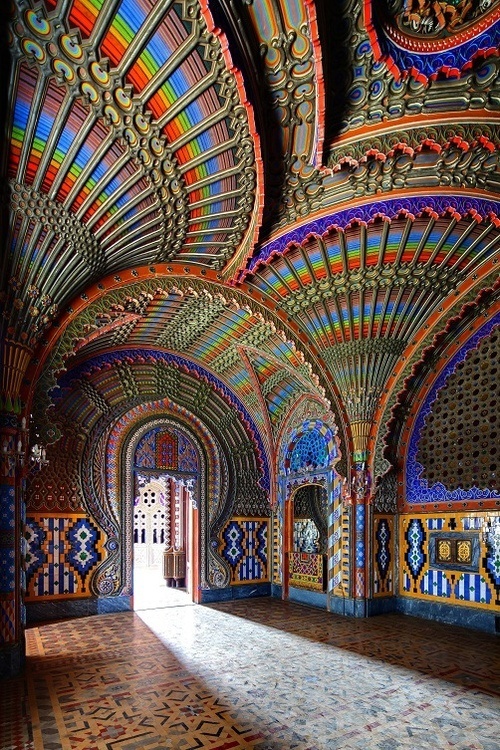 This is the architecture of your soul. I was very recently introduced to the world of Instagram yoga: courageous fun-loving super-flexy yogis posting pictures of themselves in extreme contortions from all corners of the globe. My friend told me some of these yogis have thousands upon thousands of followers, and have veritably built their yoga ‘career’ through instagram.. My mind boggled at the concept, my eyes boggled as I perused some of the poses, my friend exhorted to me that I needed to get with the Instagram program (which, incidentally and amusingly to me, I did), and I wondered cheekily whether I could build up a following of thousands by posting pictures of myself in serene meditation somewhere new and ‘daring’ every day. Because the question it brought up for me is: why are people so drawn to the ‘gymnastics’ of yoga? And is the ‘wow’ factor actually leading us astray? But for many, the allure of being fit, strong, and capable of impressive tricks, is what draws people to take the first steps on the path of yoga. It is only a matter of time, as they discover its deeper benefits, before they start to gain more of an interest in the path as a spiritual practice and as a way of life. Bingo! Everyone wins. However, as I thought more about this, about the merits of inspiring people through mad handstands, and as I started to contemplate my own foray into the world of instayoga, a more interesting question arose for me – why are the ‘successful’ yoga teachers mostly ones who can do crazy gymnastics? Is that what it takes to have credibility as a yogi or a yoga teacher now? And what is the message that ‘modern yoga’ is conveying: “Real yogis do scorpion on one hand while drinking a raw smoothie”? Now I know that human beings are human beings. And one of the truths of being human is that we like to be wowed. We love tricks. We even teach them to our dogs. And a one-handed scorpion is certainly impressive and most likely the result of a lot of physical discipline and practice. But if we get stuck there, we miss what yoga is really about. Does it matter if I can do a one-handed scorpion, or does it matter more that I have a practice and the tools to cleanse and calm the mind, open the heart, transform the spirit, shatter the ego, and develop immense insight and compassion. And we may also miss the importance of the journey of the practice… because most of us do not embark upon a practice of yoga with a ‘perfect’ body. Which leads me to my own confession: I have moments when I am confronted by others’ superior physical abilities, and in those moments of weakness I have even wondered about my own credibility. Have I not put in enough dedication and hard work? Have I not been doing the practice properly? Am I a ‘fraud’? Well actually, the answer is pretty simple: we all have different bodies, we all have different histories, and we all have different journeys. The point is to honour the one we are on. I am not one of those super-flexy crazy pretzel yogis. I was not a gymnast or a dancer, or even into sports at all, and I am not ‘naturally’ flexible. I couldn’t touch my toes as a teenager. I never even kicked up into a handstand as a child. I’ve had injury after injury (from life, not from yoga) that have compromised by neck and left shoulder, my lower back, both of my ankles, my right wrist, and hip and pelvis problems that no amount of asana practice seems to resolve. BUT, as a result, I have been on – and am still on – a journey with my body, my mind, and my heart that has taught me patience, love, and awareness – for myself, and now for my students who arrive in class with ‘less-than-perfect’ bodies. I have also derived an immense and particular satisfaction from this long and difficult journey, which I would never have had if I had arrived at my yoga practice already strong, flexible and physically capable. But most importantly, this ‘struggle’ with my body has constantly reminded me and kept me dedicated to the deeper journey of mind, heart and spirit that is the true path of yoga. This is the journey that should take us towards selflessness, wisdom, authenticity, liberation, compassion and love. If we get to a one-handed scorpion and never make it to these other qualities, we have not been practicing yoga… we have just been doing gymnastics. As much as I love my ‘yoga’ practice (think stretching, breathing, contorting, maybe even sweating), the core of it for me is still meditation. My ritual now, before rolling out my mat, is to take out my meditation cushion – even if that means on a busy day that the mat never comes out. Bad yogi? Not if you consider that asana practice is a preparatory stage and a tool, albeit an incredibly useful and beneficial one, for the deeper practices of meditation. Asana practice prepares the body to be able to sit comfortably in meditation for long periods of time. It also strengthens the nervous system to hold the energy and charge that can be generated through intense meditation and other yogic practices. Now I love my asana practice deeply, and I cannot extol the manifold benefits that can be gained through asana – especially when practiced with loving mindful awareness and an intention for insight. It can definitely be considered a ‘moving meditation’. But it is not a substitute for ‘seated meditation’. Sitting in meditation, in stillness, turning inwards and away from the external world, allows for a more refined awareness and focus. It develops discipline and a consciousness sharp enough to notice subtleties and drop into states that are missed by ‘everyday’ consciousness – or when we are busy moving our bodies from one shape into another. And it also helps us to build the tools for living everyday life with more clarity, more action (instead of reaction), and more love! Neuroscience is showing that just 5 minutes a day of meditation or ‘mindful awareness’ practice starts to build up gray matter in areas of the brain that regulate emotions, govern decision-making, and help you to feel ‘connected’. Find a comfortable seated position, cross-legged or in a chair. Allow your weight to settle comfortably into your sit bones, and then lengthen and float your spine, feeling the crown of your head open towards the sky. Your ‘seat’ should feel both grounded and effortless. Now you are ready. Make a loving resolve that you will practice with determination and kindness for 5 minutes. Resist the urge to move, fidget, or open your eyes until the time is done. It’s only 5 minutes…. set an alarm if you wish. (There are plenty of free apps now that you can use to time your meditation, and emerge with the gentle sound of a chime or bell, rather than your regular heart-pounding alarm – search for I-Qi Timer or similar). Bring your awareness to your natural breath, as it passes in and out through the nostrils. You might notice that the breath moves more easily through one nostril than the other. You might notice that the breath is either shallow or deep, fast or slow. However you find the breath, just accept and observe. You are not trying to change the breath in any way. Notice the inhale, notice the exhale, aware of the entire cycle of breath from beginning, middle, to end. If you have trouble feeling the breath here, at the nostrils, intentionally take just a few slightly deeper breaths, and then return to your natural breath. We use this small area to help refine your focus and concentration. When you find your mind of wandering (and it surely will), with absolute patience and kindness, simply bring your awareness back to your breath. Without judgment, without frustration, just simple acceptance: this is normal for the mind to wander, just patiently start over again and feel satisfied that you are doing your ‘practice’. Take a moment to acknowledge that you have done your practice, and offer gratitude to yourself for taking the time to care for yourself and practice conscious awareness. To finish, dedicate your practice to the wellbeing and happiness of all beings (don’t forget, you are one of these beings!). ‘Lokah samasta sukhino bhavantu’ – May all beings everywhere be happy and free, and may the thoughts, words, and actions of my own life contribute in some way to that happiness and to that freedom for all. I recommend starting your day with these 5 minutes of simple but powerful practice. You will set the tone for your day and no doubt you will soon notice the change it can bring just starting your day consciously and with love. Add this into your morning wake-up routine, and repeat throughout the day whenever you like, as much as possible! If you are confused, need a little more guidance, or simply have a question about the practice of meditation – please ask! Post a comment or send me an email, and I’ll do my best to share what I can to help you establish your own meditation practice.